A lot of people say that high school probably is the most memorable time of life. Well, I think it really is memorable in some ways and it is different for everyone. Some people maybe have a good memory of it and some probably don’t. Mine is I think thankfully quite good. One of the reason is that I have good friends to spend my time with. I think I have a good bond with my classmates. There are fifteen of us and we get along really well. So there is this place where I think is one of the memorable things of my high school life. It is a place where I used to hang out with them, mostly with the girls. To be noted, I live in a suburban area, not in the central of the city. I did hang out with my friends to the malls and something like that sometimes, but we are more exposed to the natural environment. And for us, being in nature is as enjoyable as spending time in the modern setting. Back to the place I talked about, it is not some kinds of fancy and modern places, it is rather more natural. It is called “saung”, a traditional wooden building with simple constructions because it only contains the roof, floor, and half wall. Tia, one of my best friends is the one who was introduced the place. It is located around her grandmother’s house in a plantation area in Padalarang, West Bandung. The location is not really far from our school so sometimes we just straight head there after school. From the “saung”, we could see a quite vast rice field and a little fish pond in one side, and housing areas in the other. So, the atmosphere is still very natural. We could see green everywhere so the air is so cool and fresh. There are a variety of trees we could see, but most of them are coconut or banana trees. The view and the cool breeze makes it really comfortable to spend our times there so we hung out there sometimes, especially when we had a quite stressful day at school. The “saung” is clean inside so we would just take off our shoes. Tia used to bring a carpet for us to sit there because it is quite cold if we sit straight in the wooden floor. She also brought some pillows from her grandmother’s house to make us more comfortable and we really were. There we talked, ate, and took photos a lot. Tia sometimes said that and we’ve never been happier. We screamed, “Yeaahhh” together and laugh, of course after we thanked Tia and her grandmother. Who does not like to get free meals anyway? We usually eat “liwet” rice (a Sundanese aromatic spiced coconut rice) using banana leaves as the plate that we took ourselves. Even though we struggled to just cut the leaves, it was really fun and I don’t know why but it made us enjoy the meal even more. We mostly talked about our school and our lives that revolved around it. Just some typical “girls talk”. We also took a lot of photos there because the scenery was beautiful. If there were the boys from our class who came, we also played some games there. One of them also usually brought a guitar and they’d just play it casually. We were simply just spent our time together. Another dishes that we usually eat is called “rujak”, a spicy fruit salad. We bought the fruit such as cucumber, yam bean, young mango, pineapple, etc. Then we made the sauce with the mix of pounded chili, palm sugar, and peanut. It was spicy that we became so hot and the natural cool breeze didn’t even enough to cool us down. I think there was the time when the rain came while we were in the “saung”. It was foggy that we couldn’t see the rice field clearly. It was also quite cold so we decided to warm ourselves by making some hot tea or chocolate. Ah, we also made some instant noodles. Sitting around together while eating and drinking made us forgot the cold for a while. Thankfully it was only the drizzle so we could come home before the sunset like we usually do. I think we’ve also once gone to the “saung” on our day off. We wanted to explore the area around it. Besides, Tia’s grandmother still has the traditional cooking equipment in her house so we also wanted to try it. Yes, I think we really loved exploring “natural” things back then. We were an explorer. 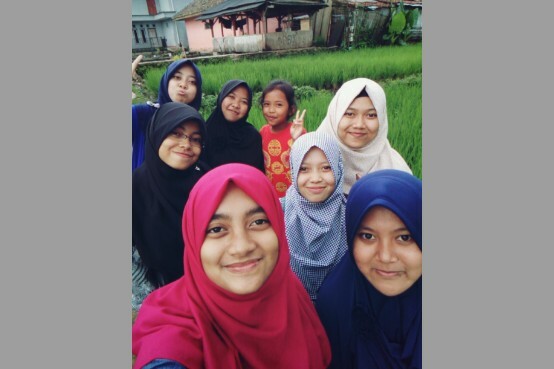 So, we once strolled to the area around the “saung”. There was a footpath alongside the rice field. The path was already paved so it felt just as normal. The only difference is that we could see a quite vast rice field in both of the side of the path. The green dominated our vision so we felt so fresh. We could see the bird flying freely across the sky and we could hear the sound of some bugs from the rice field. The cool breeze also blew as we walked. We walked for a few steps then stopped to take pictures; both the scenery and ourselves. We walked for more steps than stopped again to take other photos even though the scenery was just the same. But it was fun. It was always felt like we were on vacation. We walked for about thirty minutes then went back to the “saung”. It was a nice walking. After that, we also tried cooking with the traditional cooking equipment that Tia’s grandmother has. It was very traditional, the stove is in the form of cubical shaped stone that has a circle in the middle of it in which we have to build the fire using the firewood and control it ourselves. It does not like Tia’s grandmother didn’t have any modern cooking equipment, it was just our curiosity. We wanted to know how it works and apparently, it was really hard. It was hard to build the fire and it was even harder to maintain it. Through some struggles, finally, we cooked the meal ourselves using the stone stove then eat it in the “saung”, again, using banana leaves as the plate. It also does not like that we always use the leaves as the plate though, it was just sometimes we want to feel a different sensation. We enjoyed the meal more because we made it ourselves, we also enjoyed our togetherness, and we realized what it really means by technology makes human lives easier. So, those are some things I could tell about the “saung” and the times I’ve spent there with my friends. It was a very simple place, we did simple kinds of activities, we also ate very humble dishes, but our togetherness and the natural view that surrounded us makes it more memorable. The “saung” had memories of some of my good old days with my friends. It is the kind of memories I’d love to cherish in my heart for a long time.